The right baby nursery bedding is important to keep your baby safe and warm. Learn what you should look for in baby bedding. 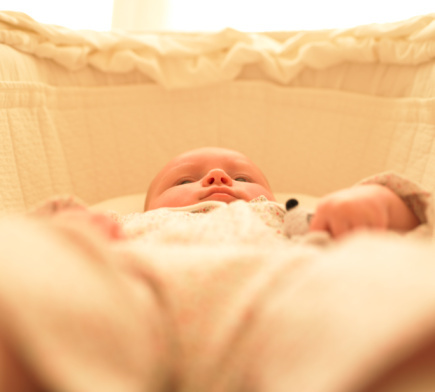 Crib bedding is especially important because babies can't regulate their body temperatures. You'll need to use the right baby bedding to make sure they're not too cold or too hot during the night. Babies shouldn't have loose baby nursery bedding in their cribs. This includes blankets, pillows, comforters, and stuffed animals. Instead use a simple fitted sheet on the mattress. Babies should sleep in zippered or buttoned footed sleepers. Young babies like to be swaddled and you should take care to tightly wrap your newborn before bed. As your little one gets older, you can replace the swaddling blanket with a sleep sack -- a zipped sleeping bag that will keep your baby warm. However, make sure these sleeping bags do not have a hood. Also don't buy these sleeping bags too large. Although it might be tempting to buy big to grow into it, it's a bad idea because the baby can slide down into the bag. Mattresses should be firm, your baby doesn't want a soft place to sleep. Also take care that it doesn't sag and that it fits well into the crib. The cover should be waterproof. Hand me down mattresses shouldn’t be used, unless you know where it came from. Avoid mattresses with holes for ventilation. It's not possible to keep these clean so they should be avoided. 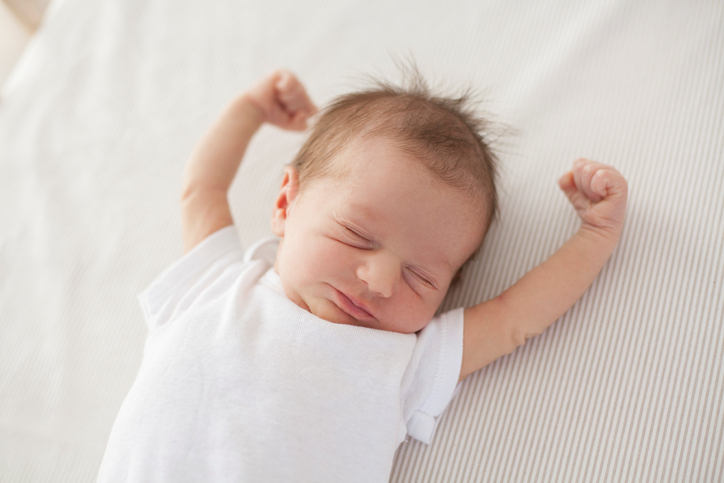 Babies spend at least 60 percent of their first year sleeping, breathing in whatever is emitted by her mattress, sheets, pillow, comforter, pad and other accoutrements of the well-made bed. This fact alone has helped lead to the beginnings of big changes in the bedding department, with a move toward natural and chemical-free fibers. The byproduct: a healthier environment. Greener bedding could cost you more, but it will wear better and last much longer. Here’s the latest on non- (or at least less-) toxic mattresses, linens, blankets and pillows. We've all survived childhoods spent sleeping on mattresses filled with environmentally unfriendly, off-gassing, petrochemical-based synthetics like polyester and polyurethane foam, and treated with stain repellants, flame retardants and other breathable toxins. Still, if you’re planning a green bed for your kid, give the mattress priority. Some commercial manufacturers have started using naturally flame- resistant fibers like wool instead of chemicals to create retardant barriers in their mattresses. An added benefit: Wool helps regulate body temperature, making for a better sleep. If you want to avoid synthetics altogether, splurge on a true eco-mattress; these are filled either with cotton and wool batting over steel coils, or natural latex from rubber trees. Latex is the firmest option and has anti-allergenic and mold-resistant properties - plus, you could hand down that crib mattress multiple times and then reuse it as a floor pad, a durability that makes up for its higher price tag if there are likely to be more children in your future. • A mattress made with environmentally friendly organic cotton and wool - if you see a Pure Grow sign, you’ll know the wool production practices emphasized sustainability. Easy-care polyester and poly-cotton blends are totally last century; now everyone wants 100-percent cotton sheets for their children as well as for themselves. But since manufacturers often give cotton a formaldehyde finish to prevent wrinkling, you might want to check out chemical-free linens. You’ll find traditional styles for kids on consumer sites devoted to allergy sufferers; if you’re looking for something more stylish than rabbits and bears (or soft pink and blue), visit some of the stores that cater to hip parents – you’ll find Boodalee and Kukunest formaldehyde-free cotton sets at Modern Mini and Duc Duc’s. That doesn’t mean the cotton’s perfectly healthy though – not for the planet, at least. Organic lines for babies, made from supersoft unsprayed, untreated cotton, are suddenly everywhere – you’ll find them at Walmart and Babies “R” Us, as well as sites specializing in eco products. The knit variety can be washed in hot water and will still stretch over your thicker-than-vinyl wool puddle pads. [link to pads]. Grow Eco Bedding has pricey modern prints on organic cotton - you can even request color matching; Stokke organic also has some fresh-looking graphics. And you can buy new lines of stylish organic bedding by young design companies like Argington and Q Collection Junior. • Undyed organic sheet sets – Natures Purest at Babies “R” Us uses unbleached and undyed organic cotton buds that are naturally cream, green and brown; another BRU line, the very bunnyish Bunny Meadow, uses a richer palette of natural dyes. • Also check out the affordable BambooBaby sheet sets in supremely breathable, naturally antibacterial bamboo jersey, an eco-fave. • Easy-wash varieties of the above: wool puddle pads you can throw in the machine and a machine-washable organic cotton bumper pad at Dream Soft Bedware are relatively new to the eco scene.